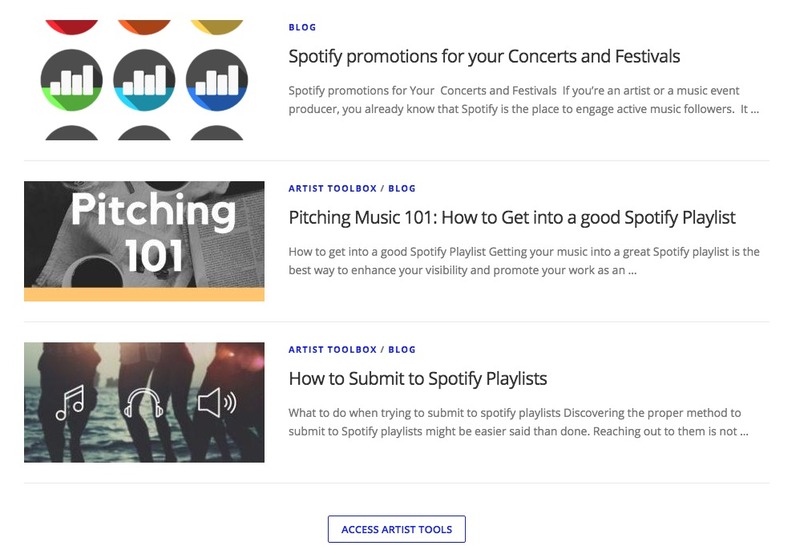 Below we’ve compiled what we have found to be the most comprehensive list of relevant and effective tools and services to help get artists on the right track to getting better Spotify playlist opportunities. We will keep this list updated as much as possible, looking for new tools or services that come up and updating the ones that we already have. We’ve listed the tools in order from Free to Paid, with our favorites at the top. So roll your sleeves up and dive into our ultimate playlist toolkit! Charmetric.io is one of my favorite tools for playlist research. Not only can I research different playlists and curators, but I can track success, see what artists or labels are getting listed on what playlists and even track my favorite playlists, artists and curators. The free version of Chartmetric.io is incredibly flexible and allows you to do a lot of research that you would otherwise be strapped to find out. The Premium version, which currently goes for $100/month, lets you dig even deeper and find playlists and curators based on very specific parameters. It also unveils some of the hidden charts and graphs about Geography Metrics, Apple Music Playlists, etc. that you would be unable to see without it. Chartmetric.io is not only great for artists, but also playlist curators – did I mention that they will send you daily updates regarding your accounts? 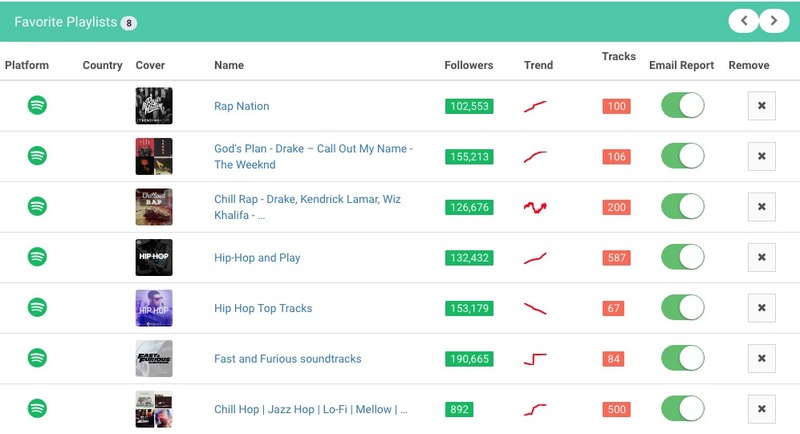 See Playlist Trends in action – how many followers, streams, etc. are they generating. All in all, Chartmetric is our favorite tool out of the bunch which is why we listed it so high on our list. This resource can be a serious help to anyone looking to level up their performance on streaming platforms. SpotOnTrack is a much simpler tool, but still a great one. 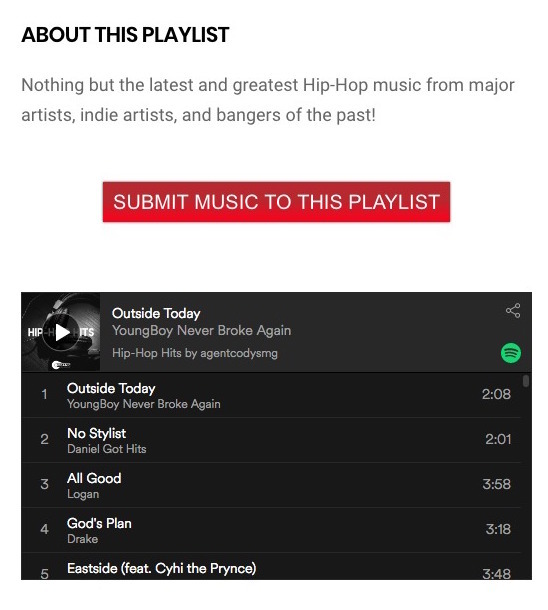 SpotOnTrack‘s purpose is very straightforward – every time an artist that you track gets added to a new playlist, you will get a daily email breaking down what playlists you’ve been added too. The cool thing about SpotOnTrack is that it will report which songs have been added to what playlists even if the playlists have no followers (see the image above). Of course it’s not great to get added to a playlist with no followers, but this means that playlists with any amount of followers and from any curator (User Curator, Spotify Editorial, etc.) will be shown. It’s a nice cherry on top that you only get emails whenever there is a new playlist. 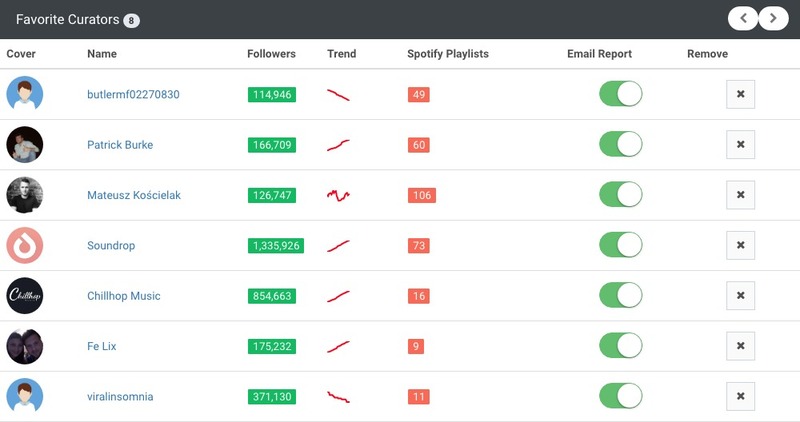 Although we love Chartmetric, each email doesn’t mean you’ll get a list of a new playlist you’ve been added to, although the numbers updated are recent. 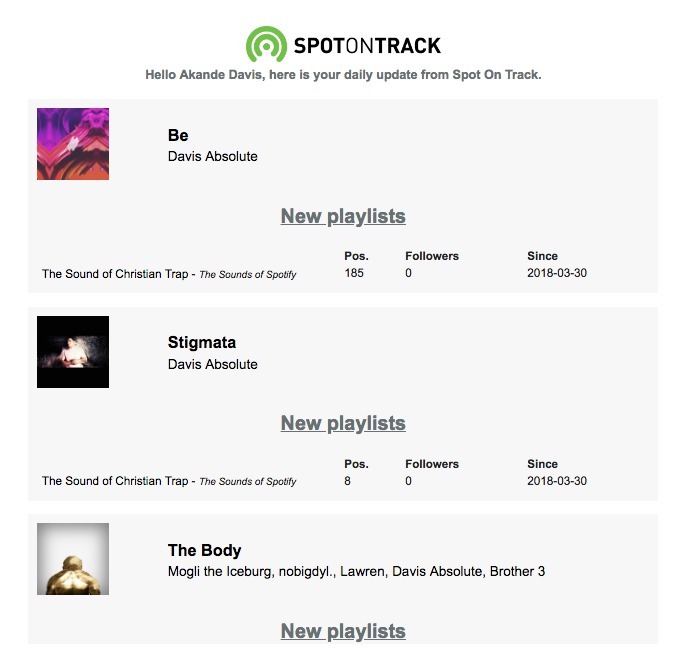 Don’t miss out – Signup for SpotOnTrack today! SoundPlate, like many of the services and tools listed below, is a playlist marketplace. This is a term I’ve made up entirely, but feel free to use it if it makes sense. Essentially Soundplate has a database of user submitting playlists that make up an extensive library. Using their platform you can submit your music to any playlist within their library, for FREE. 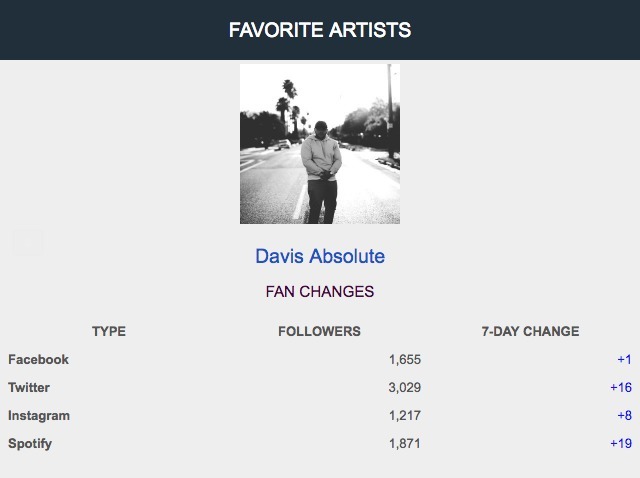 I’ve had some nice success with this platform (Davis Absolute) and seen thousands of streams come from using it. Often times playlists will pop up named after a popular show that has great music (Power, Ballers, etc.) and they will curate the music used in the show alongside submissions. The truth is, these types of platforms aren’t for every artist, but if you’re looking to get playlisted more, Soundplate is a nice place to start! Similar to Soundplate, Indiemono is a playlist database that users are able to submit their playlists or music to. The process is almost identical as Soundplate’s although their database is much smaller. We haven’t seen any success with Indiemono in a way that would be worth mentioning, but given our success with Soundplate, it made sense to include it on the list of options. Who knows, maybe Indiemono is the exact tool for you to get better playlisting! This platform is a paid solution and a unique one at that. LeavetheLabel gives you access to blog and Spotify contact databases which you can use to do personal outreach, one of the most effective form of playlist marketing. From my experience, personalized email outreach directly to relevant curators is the best way to get connected and build long lasting relationships. All of the tools that we have here are great, but none of them give you the chance to develop a personal correspondence with curators and bloggers – these directories give you that exact opportunity. I’ve been able to establish meet and greet relationships with some of the top independent curators on Spotify as a result. Now, their pricing might seem a touch steep, ranging from 140 GBP (British Pound) to 370 GBP, but if you subscribe to LeavetheLabel’s newsletter, you can get updates on specials they might have running. I was able to get the Spotify Directory for just under $60 USD during a 50% off sale! With tools like Soundplate and Indiemono, in many ways you’re shooting in the dark with submissions – you don’t know who will receive your submission and sometimes the playlists might be poor performing or even fake. With LeavetheLabel you get reliable contacts that you can use to bolster any campaign you launch for your next release. Spoti.fly, unlike Indiemono or Soundplate, takes the hard leg work out of the submission process. Essentially, you pay them to pitch your music to their database of Spotify curators. They have access to independent curators as well as Spotify Editorial staff which is a huge plus if you really want to make some waves. They give a reporting of what playlists responded to your campaign with them. Oh yeah – they have a blog/Artist Toolbox where they cover all of the tips and tricks they’ve learned about playlist submission. Playlist Push is a paid service that will submit your music directly to their carefully selected and hand crafted list of curators. Similar to Spoti.fly, they are a playlist pitching company. They don’t service with blasts like many companies do, they launch comprehensive marketing campaigns for your release. I hesitate to compare them to Soundplate or Indiemono because their relationships with the playlists are personal and their approach is hand-crafted. Playlist Push is a great resource, but not something I would specifically recommend to an artist on a tight budget (which is the only reason we have it listed last – glad you made it this far!). Make great music that is undeniable no matter who hears it. Don’t waste your money if your style, mix, production or overall songs are not significantly above the bar. Temper your expectations. One campaign with one platform won’t turn your music into a viral sensation. It is a building block for overall success, NOT success itself. Be professional and fire on all cylinders. Playlist Push evaluates their submissions one by one – make sure your Spotify profile and social media accounts are tight, neat and presentable. Make the best first impression. Playlist Push is the most premier service we have listed on this list, requires the least amount of work on your end and seems to be the most effective. If you want to take your release to the next level, consider Playlist Push! While these tools didn’t make our main ultimate toolkit, they are still pretty powerful. Spotify Artists – This is a free service that Spotify offers to help you manage and understand your analytics and research your Spotify music performance at a granular level. It lacks some of the capabilities of tools like Chartmetric, but still a really powerful native service to Spotfy that offers great insight. Apple Music for Artists – To keep up with Spotify, Apple recently launched their own artist platform. This does many of the same things that Spotify for Artists does – worth signing up for if you have music on the Apple Music store. They are in beta right now and accepting new accounts. It’s really interesting to see how differently music performs on these separate platforms. Pandora Amp – Pandora is getting into the game of making analytics available to artists. So far it has been my lowest performing platform (Davis Absolute), but it’s still good to see what kind of music is getting played with mine and what is doing well on their platform. Next Big Sound – Linked with Pandora Amp, Next Big Sound is a free application that tracks your artist brand across the web to give you an update on how your brand is performing. They will provide analytics around new YouTube views, Soundcloud plays, brand mentions and more. You get weekly reports which can be helpful. On second thought, we might add this to the toolkit at the top! Heroic Academy – This is likely one of the most comprehensive music business blogs I’ve seen on the web. They breakdown some incredibly complex topics and give you a ton of valuable information for free. They do have a service/masterclass they offer, but the audience is geared towards EDM. Ditto Music Blog – Ditto Music is a distributor, but they still offer a lot of great content on their blog as well. Distributors are becoming more competitive with how they capture and keep artists who submit music and content marketing is king. I would encourage anyone to spend some time checking out their stuff. Maybe the last tip that we can offer in this toolkit is… get to work! If you really want to get serious about getting your music out there, no matter what tools you use, it is going to be hard work. You will see failure and it might look dim, but success is usually found when you roll your sleeves up and get to it. Enjoy our toolkit and be sure to share it with other artists you might know who are looking to make an impact. This is excellent information Akande! Thank you for sharing. I have a lot of work to do!